NRG, JX Nippon Oil & Gas Exploration Corp. and Hilcorp Energy Co., have broken ground on a new project near Houston that is expected to be the world’s largest post-combustion carbon-capture facility installed on an existing coal plant. 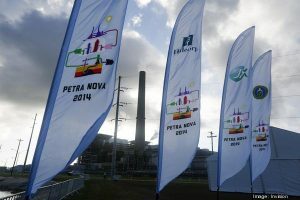 The partnership is the outcome of the WA Parish Petra Nova Carbon Capture Project that was proposed in July. The new facility is being built at the WA Parish power plant in Fort Bend County. Upon completion in 2016, the project is expected to capture 90 percent of the carbon dioxide in the processed flue gas from an existing unit at the power plant. The captured CO2 will be compressed and piped about 80 miles to the West Ranch oil field, jointly owned by NRG, JX Nippon and Houston-based Hilcorp. It will then be used in enhanced oil recovery to increase domestic oil production from around 500 barrels per day to approximately 15,000 barrels per day. When the project was announced in July, it was estimated to cost $1 billion. The companies said they would finance the project with up to $167 million from a Department of Energy Clean Coal Power Initiative Program grant. An additional $250 million in loans would come from the Japan Bank for International Cooperation and Nippon Export and Investment Insurance-backed Mizuho Bank Ltd. NRG and JX Nippon said they would chip in about $300 million each to the project. Carbon capture and storage (CCS) or carbon capture and sequestration is the process of capturing waste carbon dioxide (CO2) from large point sources, such as fossil fuel power plants, transporting it to a storage site, and depositing it where it will not enter the atmosphere, normally an underground geological formation. The aim is to prevent the release of large quantities of CO2 into the atmosphere from fossil fuel use in power generation and other industries. Experts consider it to be a potential means of mitigating the contribution of fossil fuel emissions to global warming and ocean acidification. Image courtesy of Eric Kayne. Excerpts from Houston Business Journal.